You know it’s the day before the basketball starts because the banality hits high tide just after noon and doesn’t recede until they throw the ball up Thursday night. It so happens that Cincinnati and Ohio State have managed to play their way into the East Regional semifinal here in Boston. This is rather a big deal because: (a) the two teams played each other in consecutive national championship games in 1961 and ‘62, and (b) the two teams have played each other exactly once since those matchups 50 years ago — largely because the Bearcats got really good and therefore were disqualified from ever being scheduled by the Buckeyes again. well, it was approximately as electric as oatmeal. 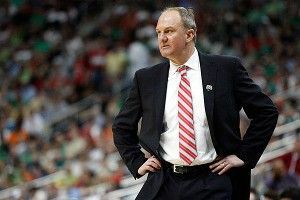 Cronin’s counterpart, Thad Matta, was a little more elaborate in saying nothing at all. “I know this from the standpoint of being at Ohio State for eight years — every game is like a rivalry. I mean, you go through 21 straight Big Ten contests, and they’ve all got that feel. We go on the road, and the school is averaging 4,000, and there’s 15,000 in the stands that night. Well, guess what? That’s a rivalry. The players, well drilled in the vocabulary and syntax of cliché, chimed right in, although Ohio State’s Jared Sullinger did cop to the fact that, “The last time these guys played [in the tournament] was, what 1961? 1962? So it’s still kind of bad blood between the two schools, so this one is going to be remembered for whoever goes to the Elite Eight.” Cincinnati’s Yancy Gates, however, was having none of this unauthorized historical digression. “I guess it’s good for our fans,” allowed Dion Dixon, a senior guard for the Bearcats. They will use this as motivation because modern sports teams can’t think of any other way to motivate themselves except by pretending to be underdogs. Unlike Cincinnati’s games with Xavier — which, this year, degenerated into a truly dangerous brawl that embarrassed both universities so much that they’re both still alive in the tournament — or Ohio State’s with Michigan, this is a rivalry with no history that anyone remembers. Which is a shame, because memory can be the sweetest playing field of all. Fifty years ago in Kansas City, the teams were sitting in the locker room trying not to throw up. The national consolation game — once upon a time, the bane of the NCAA tournament; they even used to have them at the regionals — between St. Joseph’s and Utah was dragging on through four overtimes. The players from Ohio State and Cincinnati would gear themselves up, get ready to explode onto the court, and then have to sit down again. Finally, St. Joseph’s managed to win, 127-120. There was some serious talent in those locker rooms. Ohio State had future Hall of Famers Jerry Lucas and John Havlicek, as well as Larry Siegfried, who would join Havlicek on some of the mid-1960s dynastic Celtics teams. (Bob Knight was also on the bench.) Cincinnati was led by center Paul Hogue, and by guard Tom Thacker, who’d also pick up a ring with the Celtics. In fact, either Cincinnati or Ohio State would play in every national championship game between 1960 and 1963. Neither team had had much trouble winning their respective semifinal game. Ohio State crushed St. Joe’s, 95-69, although subsequent events would cast some doubt on how legitimate that 26-point margin actually was. Cincinnati struggled a bit more to get by Utah and the tournament’s high scorer, Billy McGill, who’d put up 38 a game that season. In the finals, Cincinnati coach Ed Jucker tricked up his defense and managed to control the game, shutting down Havlicek and surviving a 27-point outburst by Lucas while four Bearcats scored in double figures. Cincinnati forced an overtime at 61-61, and was able to run out to a 70-65 win that was a legitimate upset at the time. The following year, the two teams played again for the championship, and Cincinnati whipped another top-ranked Ohio State team badly, 71-59. There was no question about the chip that Cincinnati carried into both of those games. Ohio State was a genuine powerhouse while, in 1961, Cincinnati was a small school that might as well have been in Kentucky. Everybody took for granted that the Bearcats had more to prove than the Buckeyes did, and that made the whole thing fun. Of course, that was before every college basketball coach talked like a combination of an Amway salesman and a professional golfer. Some chips were worn on some shoulders with pride, and not as simple motivational dumbshow. We will assume for the moment that the Cincinnati Bearcats are barbering the truth a little about how Thursday’s contest is just another game. Their motivation will be a memory that they don’t even know they share, but it will be as real as any memory is. They will sense it, but they will not necessarily know its source. And that’s all right, too. Every rivalry has a history. And, even if we’ve forgotten what it is, it’s still alive. OMG Jeremy Shockey Totes Tweeted a Text Message With Sean Payton!! !